Today is my birthday! Many congratulations to me! I’m so thankful to God for giving me such a wonderful family who not only wishes me but also give me many gifts. Thanks a lot to all my well-wishers.Happy birthday to me! The most special day of the year has come. Happy birthday to myself! No matter what people say or think, I know that I’m the best. May God keep me like this happy and cheerful forever! Happy birthday to me. Thanks a lot, God for giving me another year of life! The most wonderful truth is, I’m not getting old, I’m just becoming experienced. Happy birthday to the most unique person in the world; me! 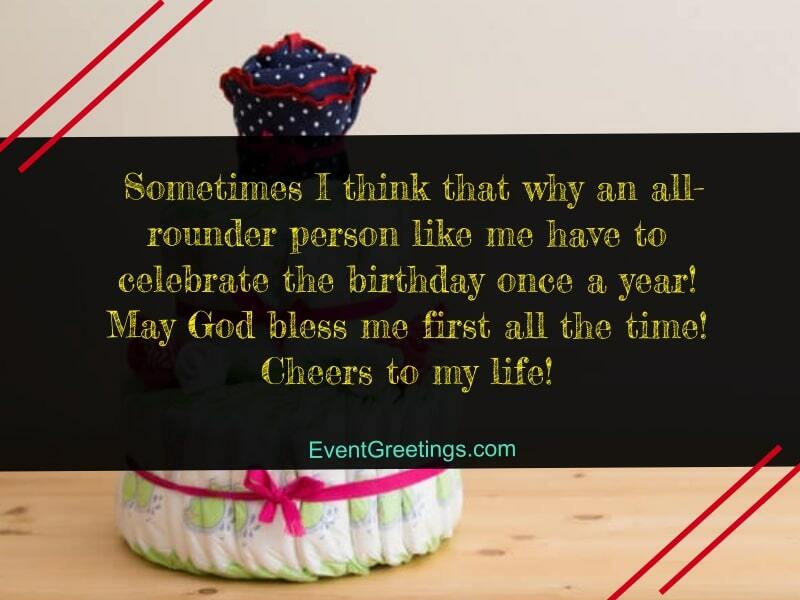 I know that many people along with my stupid friends will not come to my birthday party because I’ve told everyone to bring a gift to enter my birthday party. Congratulations to me on my 20th birthday! It’s a new phase of life and I wish, I become successful in every way and may fulfill my responsibilities toward my family and my country! Many congratulations to me for successfully completing another year. Today is my birthday! I’m a lucky person to have all the lovely people in my life and I wish to celebrate my every next birthday with them. Good luck to my upcoming years! Finally, the most awaited day has come in my life. Today I’ve officially become an adult. I’m now independent like a free bird and want to fulfill all my wishes and dreams. May God help me in every way! Today, I’m conquering another day of my life and I’m so happy to be surrounded by all my families and friends. I wish that God give me enough courage and strength to be victorious so that I can make them proud. Sometimes I think that why an all-rounder person like me have to celebrate the birthday once a year! May God bless me first all the time! Cheers to my life! Dear God, thanks a lot for giving me the opportunity to exist in this wonderful earth. May every day of my life brings new hopes for me and my life to be blessed and guided by God! Happy birthday to me! Congratulations to me for becoming a better person than the last year. May God bless me! I hope that I may grab the opportunity that life offers and become an honest and respected man! I’m really honored to celebrate my birthday with all the people I love the most. I can never forget the love and affection I’ve received from them. Whatever I am today, is only for them. May every day of my life be filled with their love, blessings and good wishes! Today, I’m in the limelight of the party because it’s my birthday. Congratulations to me! May this day come again and again in my life! Hope to have a wonderful day and a great year! Happy birthday to me! After sleeping on it during these years, I’ve understood that no one is comparable with me as I’m the best and I have all the qualities to become the king of the world. Happy 30th birthday to me! Today I’ve decided not to give my friends any treat because they didn’t give me any gift. I hope that I’ll celebrate my 31st birthday with my better half! Congratulations on my birthday! Today, I’m successful and I want to thank all my well-wishers for always supporting me and I also want to thank my detractors because their criticism helped me to come forward. Happy birthday to me! Though getting old is must and is not in our hand but being happy is mostly in our hand. I’m a happy person because I love myself. May the happiness never abandon me! The most special day of my life is today. Happy birthday to me! Thanks to my family for all the support and love during these years and hope to continue it. I wish I get many reasons to smile every day. Cheers to my wonderful life! 25 years! Wow! Happy birthday to me! I’m grateful to God for the beautiful 25 years and for everything that I have today. I hope and believe that I’ll achieve my goal and will become successful! Today, I’m celebrating another year of my life. Thanks to all who took time out for me today to give me blessings and warm wishes! May God fulfill my wishes and give me success, wisdom, and peace! Happy birth anniversary to me! Today is very special and all I want is a blessed day with all my loved one. May I keep only the good memories in mind and be very happy forever! Happy 35th birthday to me! I’m fear to celebrate my birthday because I’m still single. May God bless me with a beautiful life partner! Birthdays always comes late but leaves early. So, I just want to enjoy my day with much love. May I get all the best things in the world because I truly deserve that! Today is my birthday and I hate it because none of my friends let me sleep at night by continuously texting me and calling me. Congratulations to me on my birthday! More than a wrapped gift, I want the affection and blessings and want to be loved today and always. Hope to start fresh by forgetting all the sorrows and pain of the past. Many congratulations on my new year! I am grateful to them who remembered my special day and wished me best. May God give me an exciting and adventurous life that I really desired to have! I’m the princess of the day because today is my birthday and I wish I can live like this forever and enjoy my life. I hope to spend a gorgeous day full of good surprises and gifts! Happy birthday to me! I’m really excited to meet the new year of my life that’s starting today. I hope, it will also be as fantastic as the previous years. Good luck to me! Happy birthday to the loveliest woman in the world; me! No matter how older I become, I know, I’ll always be the most beautiful woman. Wish to have a gorgeous day! The long-awaited day has come. Happy 18th birthday to me! It’s a wonderful phase of life and I want to make the most of it. May the Almighty give me a blissful life without any worry and difficulty!